Irma Giustino Weiss, a 1945 School of Art graduate, was a believer. She believed in the extraordinary experience that is a Cooper Union education. She believed in the professional and civic contributions of Cooper’s generations of makers, leaders, doers and thinkers. And she believed in giving back. For more than 30 years, Irma supported Cooper financially to sustain and enrich opportunities for students. 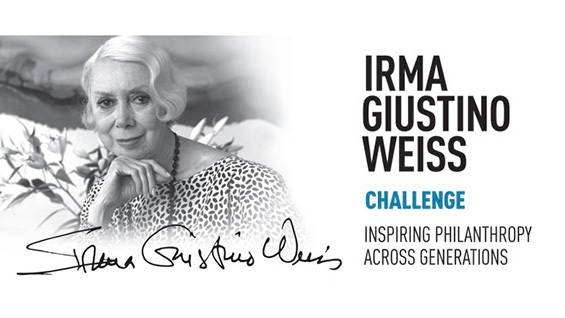 Now, with one of the largest bequests in Cooper Union’s history, Irma’s estate will match all new and increased donations, up to $4 million, that will directly support students through the Irma Giustino Weiss endowment. This effectively doubles the impact of your contributions. We have already raised over $2.2 million—help us continue Irma's legacy and reach our goal. Together with Irma’s Challenge, your gift can power $8 million in new funding for The Cooper Union.